Soak white peas for 8 hours. Pressure cook for 5-6 whistles till it is done. Take a pan and heat oil. Add garlic paste, mashed potato and cooked peas. Add salt, turmeric powder, red chilly powder and mix it well. Let it simmer for a minute or two. Keep it aside. Let it cool to room temperature. Take a bowl. Add all the ingredients and mix it well. Keep it in the refrigerator to cool it. Take a dish. Make a hole in puris and arrange it. 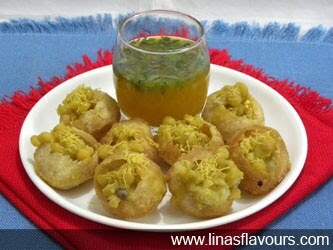 Put about tablespoon of peas mixture in each puris. Sprinkle onions, sev and serve it with chilled orange pani.